As an independent boutique hotel, we like to foster partnerships with companies who share similar values and ideas. 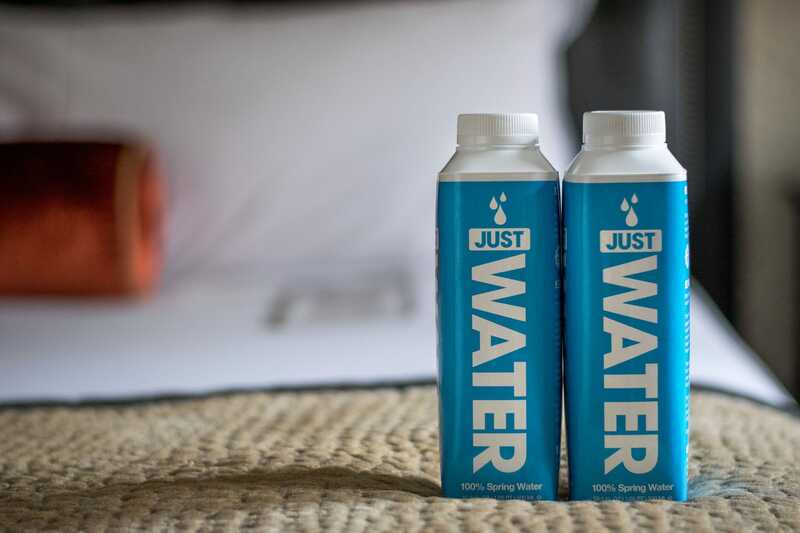 That’s why we’re so excited to partner with JUST Water! As a fairly new company, JUST has done an excellent job of standing out from the crowd. In under a year and a half, the unique, plant based bottle has made its way into shops across the nation. The bottle is made from sustainably sourced paper and sugarcane product, and has a small carbon footprint – it results in 74% fewer greenhouse gas emissions than a traditional plastic bottle. In fact, JUST Water bottles avoided emissions equivalent to taking 285 cars off the road in 2016 alone! JUST Water’s commitment to the environment and community extends to its bottling facility, located in upstate New York and sourcing water directly from Glens Falls springs in the Adirondack Mountains. Just a few hours’ drive from Boston, the facility operates out of a repurposed Church and employs exclusively local employees. The company’s dedication to their local community and sustainable initiatives reeled us in, but the great taste got us really hooked! Maybe it’s knowing the mountain water is located not far away, or that its natural pH doesn’t need adjustment, but the crisp cold water makes you feel like you’re drinking directly from the spring! Emphasizing responsible and sustainable decisions do not always prove to be the path of least resistance. Instead we take the extra effort to create a rare and inspired experience. And we do the legwork so our guests can enjoy their trip – guilt free!